Croatia captain Luka Modric has bemoaned the loss of superstar Cristiano Ronaldo to Juventus. The 32-year-old Croat put in a world class display to help his country to their first ever World Cup final, when they defeated England 2-1 over 120 minutes. READ MORE: When will Cristiano Ronaldo undergo his medical at Juventus? 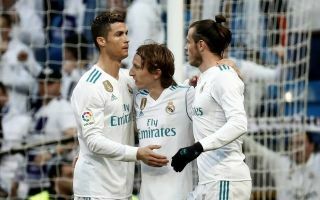 Since joining Real Madrid in 2012, Modric has been a model of consistency for Los Blancos and has won four European titles, including, three consecutive Champions League titles from 2016 to 2018. Despite playing three gruelling 120 minutes, Modric has displayed relentless energy, endeavour and creativity from the middle of the park in this year’s World Cup – which came just over a month after he shone in Real Madrid’s Champions League final win over Liverpool. However, the loss of Ronaldo to Juventus in a deal worth in excess of €100m as per the official statement on the club’s website will leave a huge hole in the Santiago Bernabeu and Modric was understandably disappointed. “My wish was for Cristiano to stay. He is unique and it is a pity he has left,” the 32-year-old told reporters, as per Goal, after Croatia’s semi-final win over England. Ronaldo will leave having scored an extraordinary 450 goals in 438 games making him Los Blancos’ greatest ever goalscorer.